This is a short article I wrote for our Biology Department’s newsletter. A 2012 Nature article titled “There’s more to life than rats and flies” highlighted the fact that experimental biologists use only a handful of species. These are probably familiar to most of you – the mouse and rat, Drosophila, Caenorhabditis elegans, Arabidopsis… These model species continue to be used due to inertia and because their properties are well-known: They are easy to raise and care for, and convenient to study. Although these models have resulted in huge leaps forward for science, the limited diversity brings a cost. Translating the knowledge gained to other species can often be tricky, which is a particular concern in studies of human disease. The same kind of taxonomic bias exists in other fields including population biology and evolution. Most long-term population studies on birds seem to be done on passerines (and many are on species that will conveniently nest in man-made boxes), similar studies on mammals tend to be on ungulates. Studies on plants are no exception to this bias with most studies being on herbaceous perennial species. I received a grant, with Sydne Record and Rob Salguero-Gomez, from the British Ecological Society where we take a small step to change this by studying European mistletoe (in Danish, Mistelten – Viscum album) a parasitic plant that lives in tree canopies. Not only is this a rarely-studied taxon, it is also a species with a demographically poorly understood lifestyle. This is surprising given the iconic status of the species, and the fact that it is regarded as a keystone species where it is common. It provides winter food for birds (who spread its seeds) and its fallen leaves provide nutrients to plants. It also caters for insects such as the mistletoe marble moth (Celypha woodiana) [pdf], which relies on the plant as a larval food source. Mistletoe in Denmark (A); A new recruit to the study (B); A mature mistletoe plant (C). Mistletoe steals water resources from its host but must also photosynthesise. I am particularly interested in how their “cheating strategy”, which enables them to escape much of the cost of being a plant, influences their demography. For example, being large and high in the tree is beneficial for the mistletoe since it will increase reproductive output, robustness and access to sunlight. However, if it is situated too high in the canopy, or becomes too large, it risks causing cavitation (formation of air bubbles) in the xylem of the host. This could kill the host, or the limb on which the mistletoe stands, and thus the mistletoe itself. Therefore a balance must be struck – both for size and for height in the canopy – and this will have an influence on growth and reproductive output/death rates. Some mistletoes are easier to reach than others! Studying the biology of species that are typically high in tree canopies is challenging, not least because the best time of year to study them is winter when the leaves have fallen from the host (mistletoe retains its leaves, and reproduces in winter). We do a lot of work from the ground using cameras, binoculars and telescopes, with follow-up work using digital image analysis tools. However, we also climb into the canopies using techniques borrowed from cavers and arborists to get hands-on measurements. For the next field season we are also investigating the use of flying drones, with the help of researchers at the University of Southern Denmark’s Faculty of Engineering. These will allow us to get up close to the mistletoe at the very top of the trees without needing to climb. 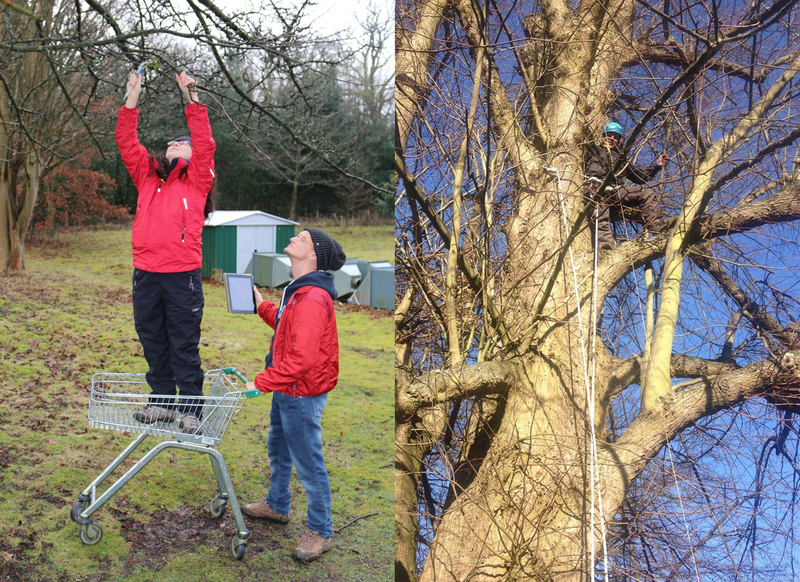 Although European mistletoe is widely distributed, including in Denmark, our study site is in the UK. I would love to have a field site closer to the University of Southern Denmark, but the distribution in Denmark is very sparse. If you have spotted mistletoe nearby [on Fyn, Langeland, Tåsinge etc. ], please let me know! This entry was posted in Uncategorized on March 6, 2015 by owensdu. Some species live for a very long time, others more fleeting. Bristlecone pines have remarkable life spans of around 5,000 years and in the animal kingdom, creatures like elephants, whales and tortoises are comparatively long lived. Some of these even achieve individual fame; Harriet, one of the Galapagos tortoises supposedly collected by Darwin himself in 1835, died in 2006 having reached the astonishing age of 175. At the other end of the spectrum, creatures such as the mayfly or annual plants live for just a day or a year. The lifespan of modern humans can exceed 100 years. This puts us somewhere in the middle. Underlying these figures are demographic patterns – the trajectories of mortality and fertility that respectively capture the changing probability of death and number of offspring produced, with age. Why do we deteriorate with age? Considering the enormous effort that goes into creating an entire organism from scratch, it seems odd that they should degrade with time: after all, maintenance of the body should be a relatively minor task. Since deterioration with age (in humans this might be less elastic skin, weakening bones or memory loss) confers no advantage to the individual, why it happens has long been a puzzle to biologists. The esteemed Peter Medawar referred to it as “an unsolved problem of biology”. In the 1950s, 60s and 70s, Medawar, along with George Williams, Bill Hamilton and Tom Kirkwood, set their sights on explaining why evolution had resulted in senescence – the biological process of ageing. Their theories, collectively called the “evolutionary theories of ageing”, focused on the influence of selection over a life course. Essentially, these theories point out that after sexual maturity, evolution’s power – or the force of selection – declines because the remaining number of offspring an individual is expected to produce before its death also declines – even if its eventual death is entirely due to chance and/or has no relationship with physical deterioration. Mutations that result in increased reproduction early in life will therefore be favoured by selection even if they come at the cost of decreased later survival. The theories say that even mutations that confer no early-life benefits will tend to accumulate, since the force of selection becomes too weak to purge them from the population. From this, the resulting trajectory of mortality should show an increase from the age of sexual maturity while fertility should decrease. But are these patterns truly universal? To test the universality of these predictions, our team based at the Max Planck Institute for Demographic Research (the second largest demographic research body in Europe) and latterly at the new Max-Planck Odense Center on the Biodemography of Aging, gathered data to examine the demographic trajectories of a wide range of organisms. The two main types of data for demographic studies are the life table, which records age-specific death and fertility rates, and the population projection matrix, which records transition probabilities from age-to-age or stage-to-stage, (for example juvenile to adult or small to large) and the fertility of each stage or age. Researchers have constructed these tables and matrices for decades. We scoured the literature to obtain such data for as wide a range of taxonomic groups as possible, while ensuring that it was up to the job: we needed data that followed individuals for at least 95% of the mature life course. We defined the mature life course as the time between maturity and the age at which survivorship fell to 5%. A simple, but novel approach was then used to standardise the trajectories of each organism across this life course to map out shapes that could be compared among species with vastly different life spans and levels of mortality and fertility. What we found was surprising. Although many species – like humans – showed mortality trajectories consistent with the classical theories (fertility declines, mortality increases), we found plenty of violations. 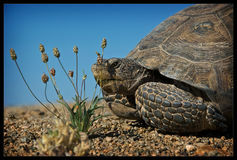 In some species, such as the desert tortoise, mortality actually declined with age, while in others such as the tiny freshwater organism known as the hydra, it remained constant. There was just as much diversity in the fertility trajectories, which could be hump-shaped (increasing and then decreasing with age), increasing, decreasing or flat. Amazingly, the shapes of the mortality trajectories were not strongly associated with the lifespan of the species. In other words, both short and long-lived species can have increasing, decreasing, or constant mortality rates. This makes sense when you think about it – even with constant mortality, lifespan will largely depend on the absolute level of mortality, not whether it is increasing or decreasing. Vertebrates such as humans and other mammals tend to have increasing death rates and hump-shaped fertility, while plants were highly variable. Why might this be? There are certain to be features, such as the basic body plan, that become fixed early in evolutionary history that are lacking in others, and these features may constrain the evolutionary options open to a species. To that extent our paper raises many questions. Although the classical theories appear to work well for most mammals and birds, theoreticians will need to turn to them again if we want our theoretical understanding of ageing to be universal. Then we need to explore the data to gain an understanding of why some species don’t follow expected patterns. Of course, to do this, we should look at a wider range than we currently do. As a start we’re going to focus on the plant kingdom, a particularly interesting group for which there is abundant demographic data. This group shows a huge diversity in their demographic trajectories, and a similarly wide range of life styles. Where they live, such as in desert, tropical or grassland regions, and what kind of plant they are. We have a long way to go, but it’s clear that with studies such as these and those in the lab, we will slowly come to understand why species – including humans – age in the way they do. Eventually, this knowledge may even help us figure out ways of slowing, halting, or even reversing the ageing process. This entry was posted in Uncategorized on February 9, 2015 by owensdu.